When I was in junior high, I would sometimes walk to the public library after school. I was terribly productive there, and I could avoid the bus by waiting for my mom to finish work. Yes, the bus was that bad, like playing-Nickelback-the-whole-ride-home bad. The library was a discovery of resources. A whole building full of books?! Why haven’t we been coming here every day? I often think this each time I step into a library. They pass. We forget. We stay away from the library, avoiding large fees and the librarian’s stink eye. We let time go by. The librarian retires. We go back. We realize (again) how cool libraries are. We check-out. We think we can do it this time. But back on track. In middle school, I was (again) in the discovery stage, and the public library was (again) a magical place. In this glorious building, I fell in love with a boy: Jehu. He had a scar on his cheek and never apologized for being himself. He was a sailor with tanned skin and blue eyes. Okay, okay, Jehu is from a book, but not just any book. Jehu is from Jennifer L. Holm’s Boston Jane. Boston Jane isn’t really about Jehu. Guess who it’s about? Yes, Jane. e.e. cummings said, “It takes courage to grow up and become who you really are.” That’s what Boston Jane is about: finding that courage to be true to yourself. Awwww. Just read it, okay? Good. Now, if twitter had existed in middle school, I would have been showing off this Jennifer Holm re-tweet like nobody’s business. 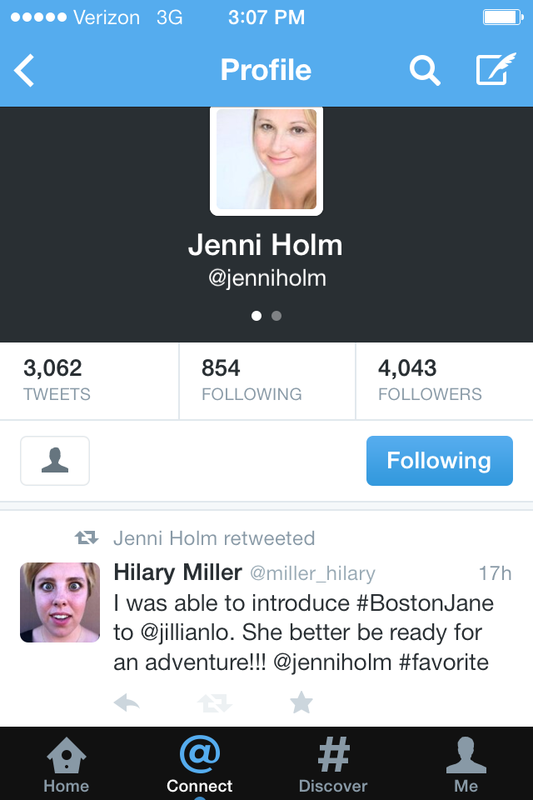 But since I’m older, I’ll just SHOW OFF THIS JENNIFER HOLM RE-TWEET LIKE NOBODY’S BUSINESS (in capital letters).